Southern Biscuits and Chocolate Gravy is an Arkansas favorite and a special breakfast treat for all ages! 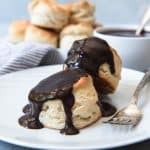 Tender, flaky southern buttermilk biscuits are smothered in a rich homemade chocolate sauce for a wonderfully unique start to the day that is truly Southern! In a large bowl, combine the flour, baking powder, baking soda, salt, and sugar. Using a pastry cutter or food processor, cut the cold butter into the dry ingredients until crumbs about the size of peas form. Make a well in the center and add the buttermilk, then stir with a spatula or fork just until the dough starts to come together. Turn the dough out onto a lightly floured surface and knead 5 or 6 times. Pat into a rectangle then fold the left third over, then the right side over into an envelope shape. Pat down, turn the dough a quarter turn, and repeat the folding process once more before patting the dough into a 1-inch thick rectangle. Cut out biscuits using a circle biscuit cutter, pressing straight down without twisting the cutter, then transfer to a parchment-lined baking sheet. Bake for 14-16 minutes until the tops are golden. Remove the rolls from the oven and brush with the melted butter, if desired. In a large skillet or sauce pan, whisk together the sugar, cocoa powder, flour, and salt until there are no lumps. Pour the milk into the dry ingredients and whisk until combined, then cook over medium heat, stirring frequently, until slightly thickened, about 7 to 10 minutes. Remove the chocolate gravy from the heat and stir in the butter and vanilla until the butter is melted and combined with the sauce. Serve immediately over buttermilk biscuits. Chocolate gravy recipe adapted slightly from My Recipes.